While I was watching the adult riflebird performing near the cabin, I spotted a Lumholtz’s Tree-kangaroo in the large wattle (Acacia melanoxylon) nearby. We have seen tree-kangaroos in that tree on several occasions. This male stayed in the tree all day, taking naps between short episodes of feeding. What a day! I didn’t know where to point my camera. What’s next? Tree-roo joining riflebird on the dance pole? This morning, while watching Musky Rat-Kangaroos in our garden, we heard Sulphur-crested Cockatoos (Cacatua galerita) screeching quite differently from their normal calls. We discovered a group of 5 birds in the large Kuranda Quandong tree behind our house, harassing a Lace Monitor (Varanus varius), who had been minding her/his business, only trying to warm up in the early morning sun. The cockatoos were quite brazen, getting very close to the lizard, even pulling on its tail, which the poor lizard then curled up in front of it. The cockatoos started snipping off twigs and branches close by, fortunately the goanna was sitting on a very sturdy branch. It didn’t show any aggression towards the annoying cockatoos, unless it was provoked. The reaction then was an inflated throat and a gaping mouth. 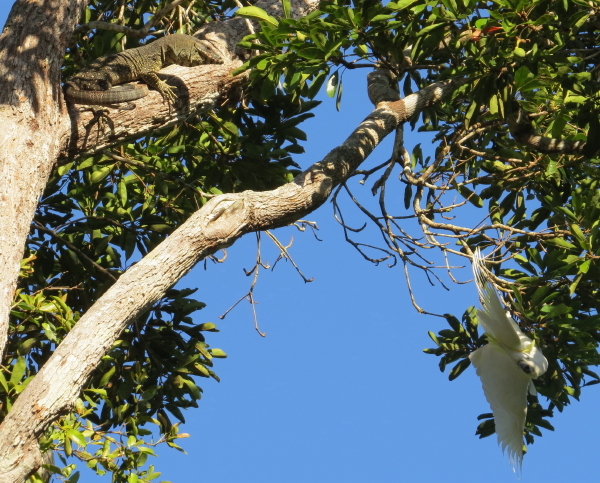 After about half an hour, the cockatoos flew away, and the lizard could finally relax. 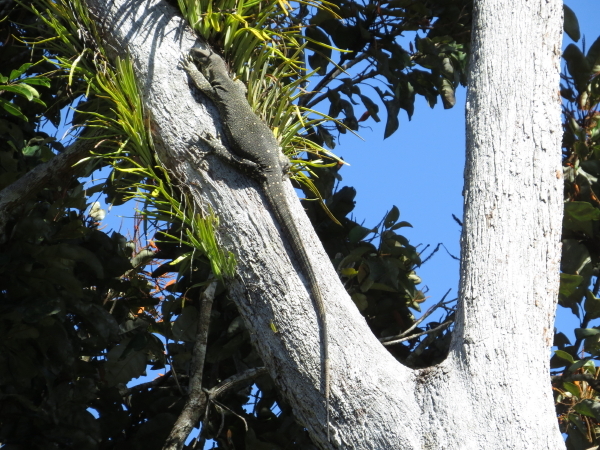 As you can see, the tail with its long, narrow tip is unscathed, but you often see lizards with the tip missing. Brush turkeys also relentlessly attack them when they are on the ground, often biting into their tails. 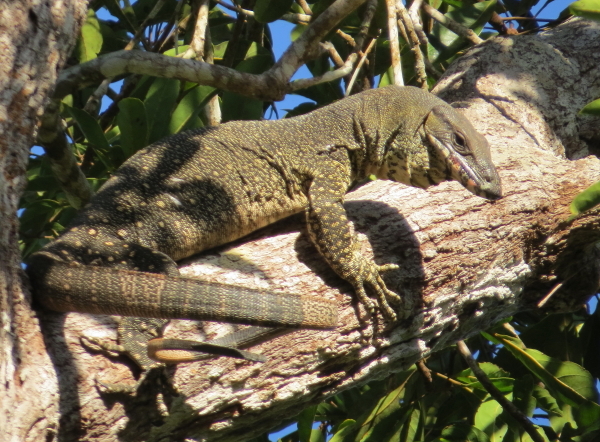 They have reason to scare off the lizards: goannas often raid nests and the Brush turkeys’ breeding mounds. 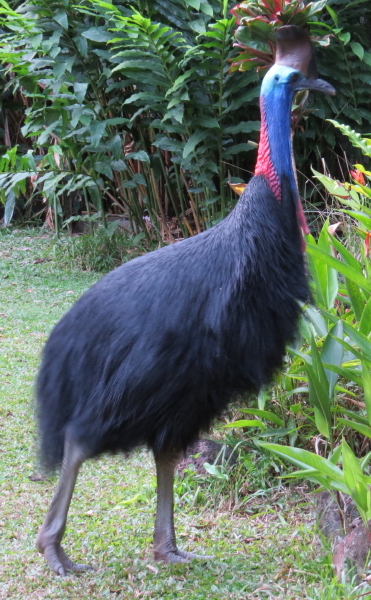 After mating throughout June our male cassowary (“dad”) disappeared, presumably sitting on a new clutch of eggs, while the local female continued to visit our garden infrequently. She was here a few days ago, and after eating some palm fruits and lilly-pillies, made a deep, booming call. 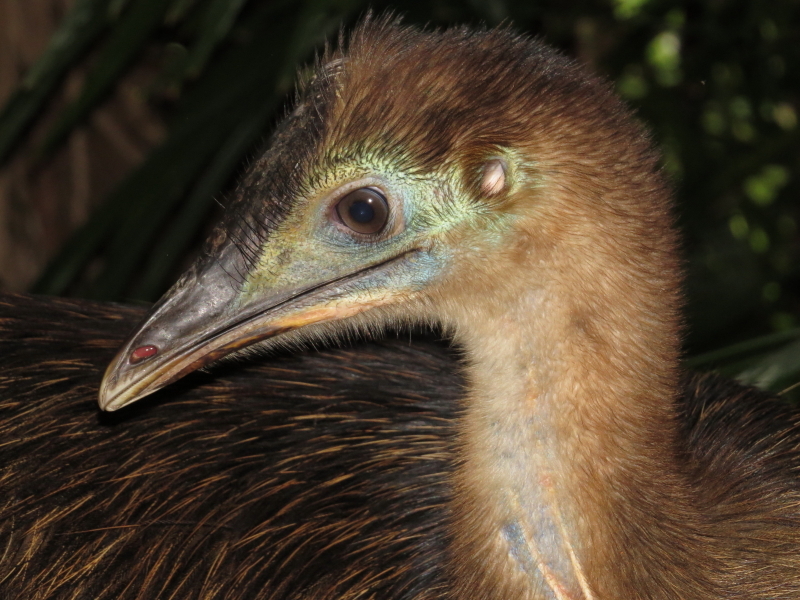 Shortly after that, there were two adult cassowaries drinking from our pond – dad was back! Apparently he had been off his nest for a few days, abandoning it – maybe driven away by the pigs, which have been around recently. Something looked strange about the female, and then we realized she was a stranger! She is at least as tall as “Missy”, our resident female, but with a taller casque and dark blotches on her two red wattles, one of which has two tips. 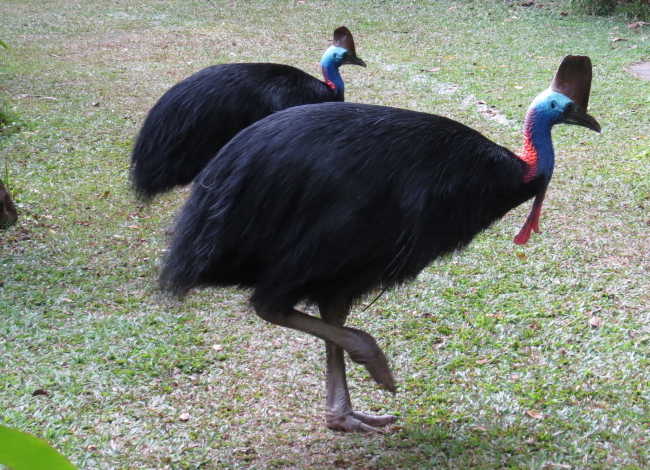 She might be the one who had a fight with Missy near “Cassowary House” recently. Presently we are seeing dad always in the company of the new female, while Missy has been busy chasing the 10-month-old juvenile, which is, surprisingly, still visiting the area. 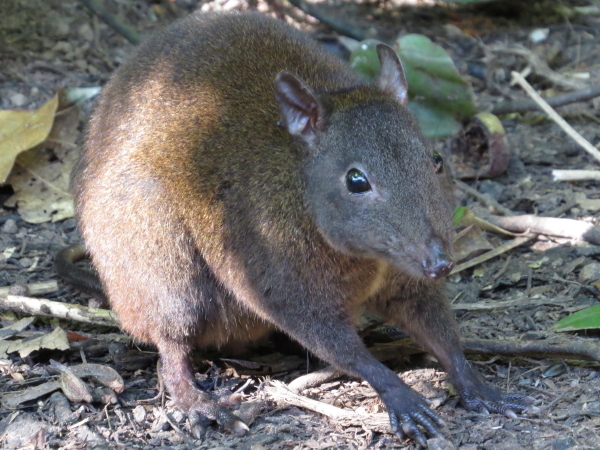 There does not seem to be a lot of ripe fruit available in the forest at the moment, but cassowaries also eat fungi and animals like worms, grasshoppers, mice and lizards. Hopefully, dad will be able to put on enough weight to sustain him through another period of brooding. 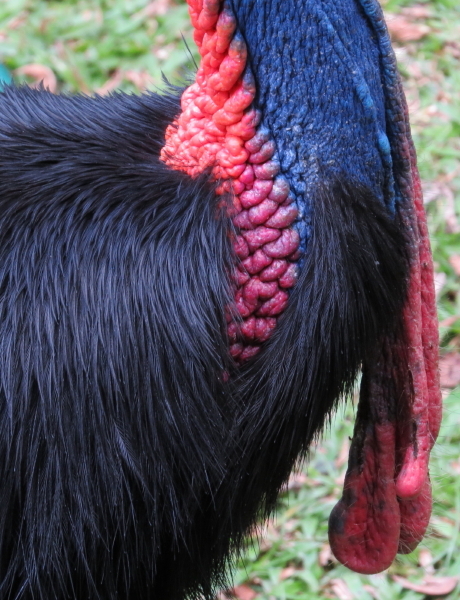 Male cassowaries sit on eggs for about 2 months without feeding. The September issue of the “National Geographic” magazine has an article on our ‘Big Birds’, with more photos of Dad, Missy, and last season’s chicks.